residential component of its proposed plan” and will instead offer “a plan that is compatible with the City’s strategic plan.” In other words, no condos for Coney. If Sitt was hoping to cut a deal with the city by swapping condos for time shares, in other words, he looks to be barking up the wrong tree—especially when you consider that Lieber is the highest-ranking official yet to have dissed Thor’s plans, and in some of the city’s strongest language to date. theater on the current Astroland site and a pair of 20-plus-story hotels along Stillwell Avenue. (Or perhaps in the middle of Stillwell Avenue—the artist appears to have failed perspective drawing.) 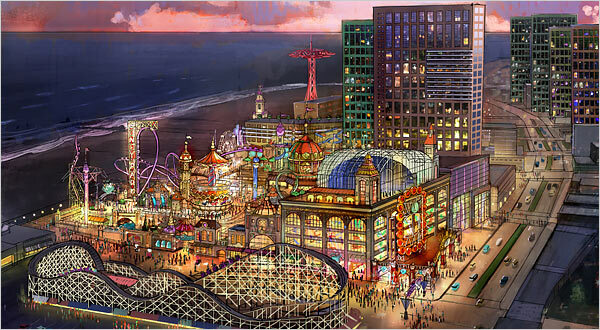 Of course, the illustration also portrays a Coney Island of the future that’s missing the Steeplechase Pier, the landmarked Wonder Wheel, and Keyspan Park, so perhaps it’s best not to take this latest of Thor’s ever-changing plans too literally.